It is official, Trump has been accepted by the oligarchy and is now one of them. All he had to do was bomb a sovereign state. In her first interview since her defeat in the presidential election by Donald Trump, Hillary Clinton called on the United States to bomb Syria. Only hours later, in lock step with his formal alleged ‘rival,’ Trump sent 59 Tomahawk missiles hurling into Al-Shayrat air base in Homs, using two US Navy destroyers. This strike came with zero approval from Congress, zero investigation into the alleged crimes of Assad, and, in spite of Trump’s longstanding history standing against US meddling in Syria. 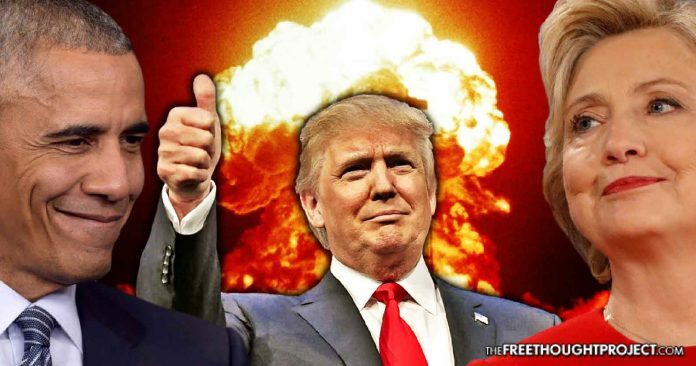 Trump waited only 77 days before lighting the fuse that could potentially set off World War III — in spite of expressing concerns over this very action years prior. All of these tweets came after alleged sarin gas attacks on the Syrian people by their leader Bashar al-Assad. These tweets came on the heels of suspected attacks in which hundreds of innocent people died. A single attack in August of 2013 killed ten times as many people as the recent alleged attacks — yet Trump still warned against going in. Fast forward four years and we see an entirely different Donald J. Trump. The new Trump, who ran on a non-interventionist platform, now has no problem unilaterally attacking a sovereign state with zero regard for the potential repercussions with Russia and in spite of the constitution. Certainly, one would think that the ostensible left would react with backlash and call out this most obvious hypocritical and criminal behavior. However, one would be wrong. Up until this week, the entire front page of the Washington Post was mostly plastered with anti-Trump rhetoric. The same can be said for political threads on Reddit, the New York Times, and multiple other establishment left wing outlets. Every chance the establishment got to bash Trump — they took it. Now, however, all that appears to have changed. When scrolling through Reddit, WaPost, NYT, and the like, all these outlets have taken a different approach to reporting on Trump — they are now praising his decision to bomb Syria. They have also picked a new enemy in the White House to bash too, Steve Bannon. When the United States is at war, the mainstream corporate media becomes their mouthpiece — essentially becoming state-run news. Everyone who is paying attention, knows that presidents say one thing to get elected and do another once in office. Sadly, the supporters they gain while running are often so star struck that their candidate won, they refuse to see the glaring differences once they’re in office. Obama — just like Trump — deceived his voting base into thinking there would be change. Obama was even a recipient of the Noble Peace Prize for his ‘pro-peace’ stance before waging hell across the world. Prior to Obama leaving office, he deployed thousands of troops on Russia’s doorstep in Poland. He ordered ten times more drone strikes than Bush. In 2016, alone, he dropped more than 26,000 bombs. He put boots on the ground in Syria, in spite of saying ‘no boots on the ground’ more than a dozen times. He also arranged the largest weapons deal in the history of the United States to the terrorist regime in Saudi Arabia. Just like Obama, Trump is curtseying to the terrorist Saudi Arabian regime and selling them weapons which are in turn used to kill innocent women and children. Just like Obama, Trump is continuing war, and in fact, doubling down. Just last month, Trump dropped more bombs in Yemen than Obama did in all of 2016. Trump is on track to become far more deadly than Obama and he’s less than three months into his presidency. What’s more, the establishment is praising him for it! War is the language of the state and Trump just finished his Rosetta Stone lessons. His recent act of uninvestigated violence in Syria has even earned him the praise of his sworn enemy — Nancy Pelosi. Just like Bush, just like Obama, the unfettered use of the United States’ military might is strengthening his position within the establishment and garnering bipartisan warmongering support — both from Washington and the media. CNN’s Fareed Zakaria even declared Trump’s act of violence in Syria his defining moment and officially accepted him as the President of the United States. Trump’s recent praise and adoption by the left proves there is no left or right in this country — only war. The left is for war, if with big government; and the right is for big government, if with war. Given all that, could American elites possibly believe him when he says that he is motivated by humanitarianism – deep-seated anger over seeing Syrian children harmed – in bombing Syria? Yes, they could, and they are. In the land of the free, war is the common ground on which the masses find resolve. All the divide and hate used tear society apart during elections is quickly dismissed as Americans focus their hate on brown people on the other side of the planet who’ve done nothing to them. Unfortunately, the masses are easily distracted and manipulated into fearing whatever boogieman the state throws at them. This fear and distraction, in turn, feeds the military industrial complex while laying waste to human rights — both abroad and domestically. But no one cares, as long as war is elsewhere. All hope is not lost, however. While Trump managed to gain bipartisan war hawk support last night, he lost many of his followers who supported his non-intervention stance. We can use this window to unite against the military industrial complex and spread a message of peace and liberty. Please share this article to show those who may be on the fence about staying on the Trump-train, that their support of Trump only serves to feed the monster that is the deep state.